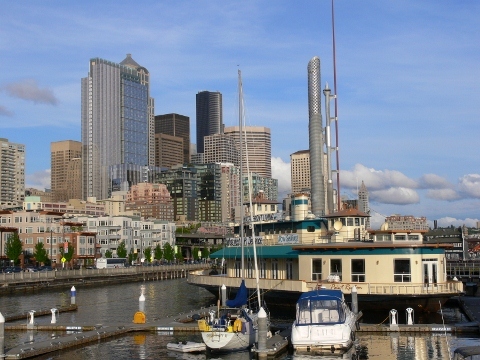 We moor most of the time at Bell Harbor Marina in downtown Seattle. 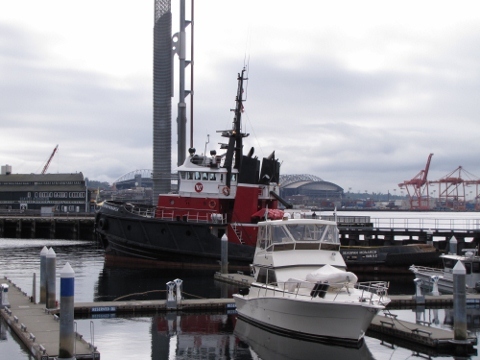 About a third of the marina’s slips are available for monthly moorage over the winter, and the remainder are for transient moorage only. 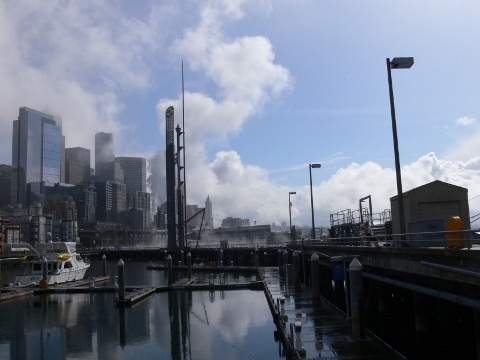 We enjoy the continually changing scene as boats come and go. Some weekdays the marina will be almost empty, and other times a yacht club will secure every available spot, even med-mooring at times to fit everyone in. 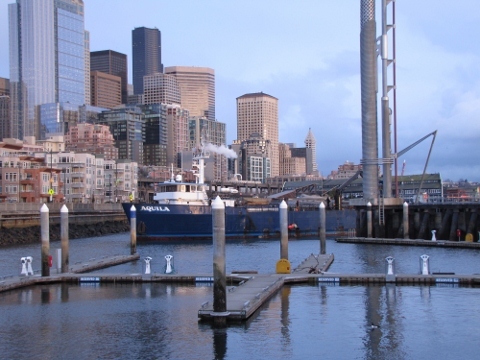 And at the marina’s charter dock and the adjacent Terminal 66 Cruise Facility, some of our transient neighbors can be quite large. 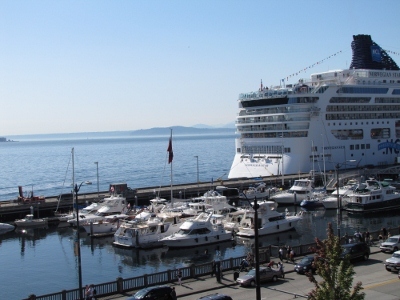 From May through September, we can step outside at dawn with a cup of coffee and watch a cruise ship slowly approach, make a wide turn and dock a few hundred feet from our boat. 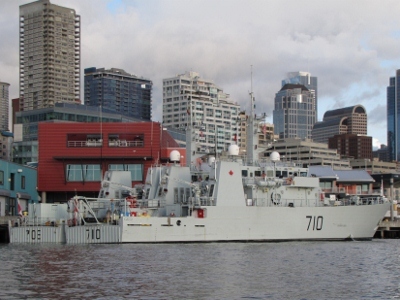 Navy ships also frequent that dock–besides the US navy, we’ve seen French, Canadian, and Russian ships moored there. 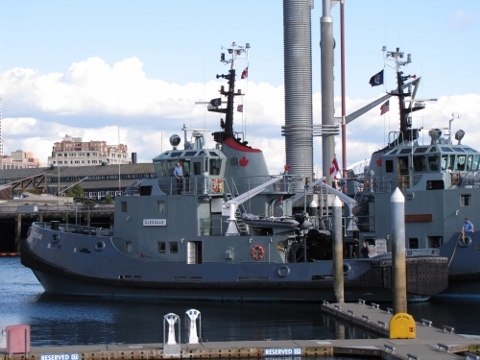 Ships on the charter dock have included the refurbished ferry that is the floating sales office for the Point Ruston condo project, the Canadian Forces Auxiliary Vessels Glendale and Glendyne, the Seaspan Monarch. 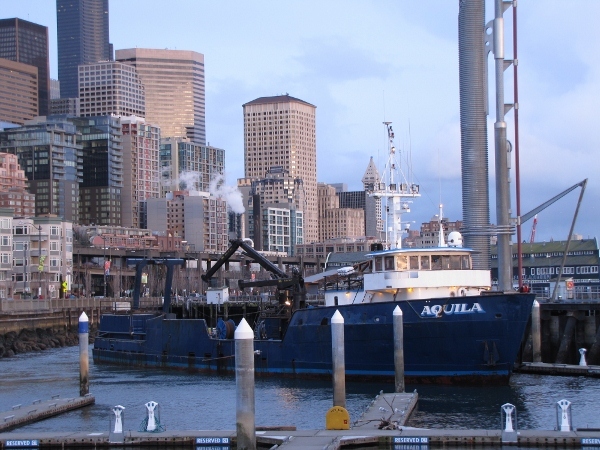 Recently, the fishing vessel Aquila spent several days on the charter dock. 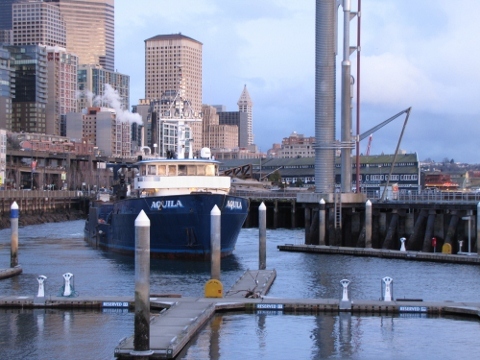 We usually walk down to check out these boats, and were particularly curious about the Aquila. 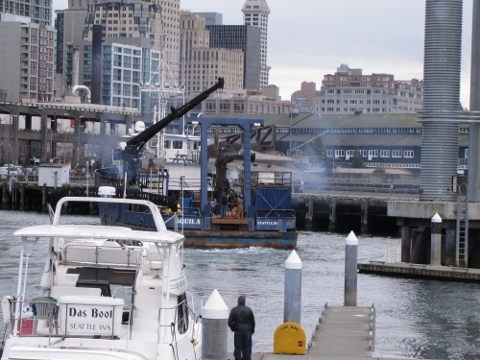 It looked similar to the crab fishing boats we see on Deadliest Catch, and we were wondering why it had come into the marina. 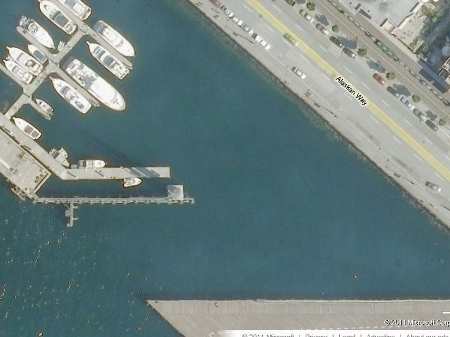 Usually boats of that size will moor on the outside pier rather than work their way into the marina. 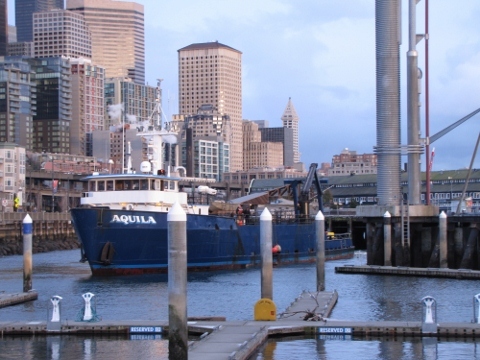 The Aquila, it turned out, not only was a former Alaska crab fishing boat, but it was a chase boat for the previous Deadliest Catch season. 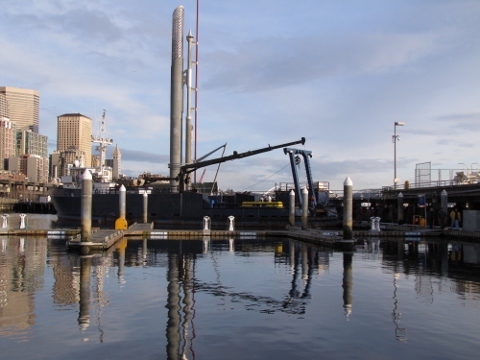 Owner/operators Kale and Angela Garcia had chartered it to Applied Signal Technology, a company that Raytheon had recently purchased. Applied Signal Technology was demonstrating their HD sonar technology to prospective customers throughout the week. 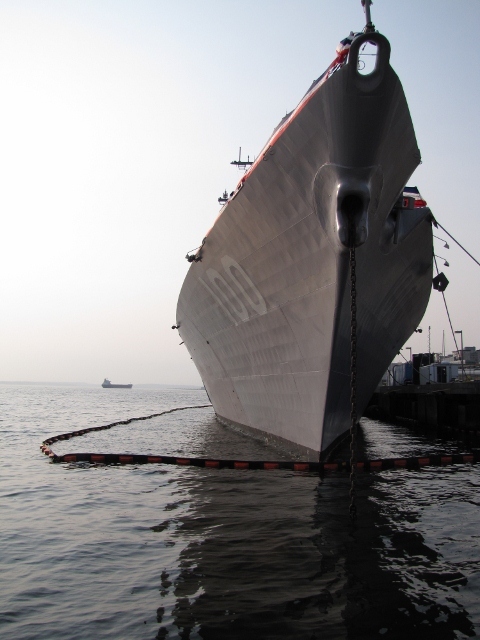 That’s why the Auqila was inside the marine–the outer dock has much stricter security. 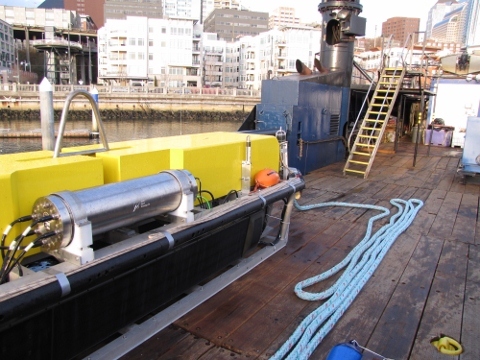 In the pictures below, the large yellow box on deck is the sonar, and the pole attached to the side of the Aquila is used to track the sonar’s location. 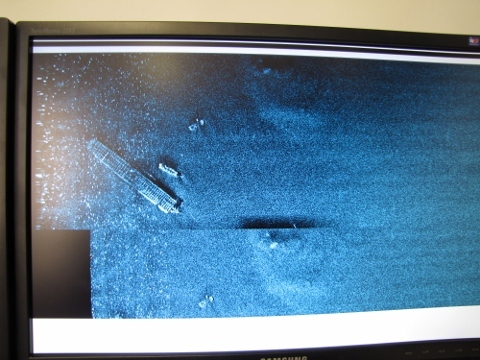 An image taken that day of a wreck off the Elliott Bay sea floor near West Seattle was so clear it looked almost like a photograph. 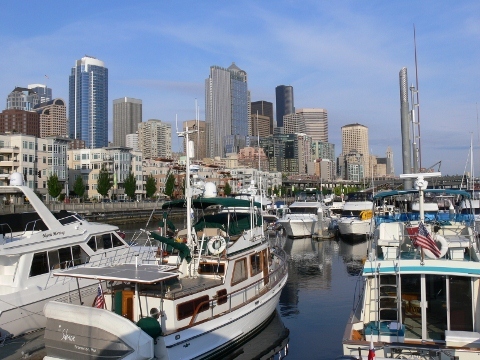 The Aquila was at Bell Harbor Marina for a week, leaving each afternoon and returning each evening. Kale Garcia is amazingly competent with that boat. 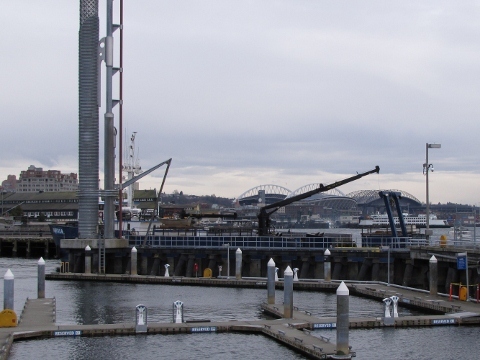 The entrance to Bell Harbor Marine is about 75 feet wide and requires a blind, 120 degree turn to port shortly inside, with about 200 feet between the end of the pier and the shore. Below is a video of our entry last week. 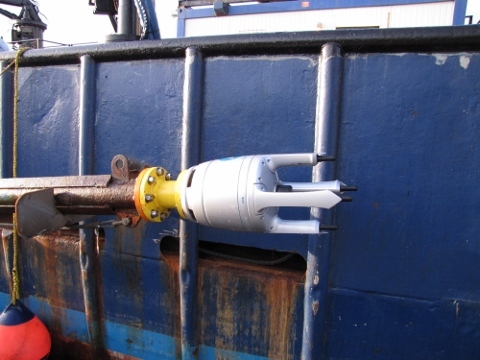 We find it tight in our 52′ boat, with it’s 16′ 1″ beam, particularly if much wind is blowing. 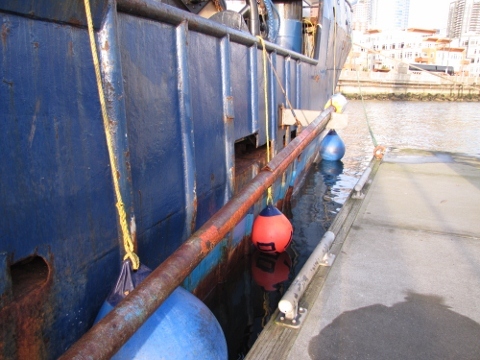 The Aquila is 150′ long with a 40′ beam–we have no idea how Kale managed to get that boat in and out each day. 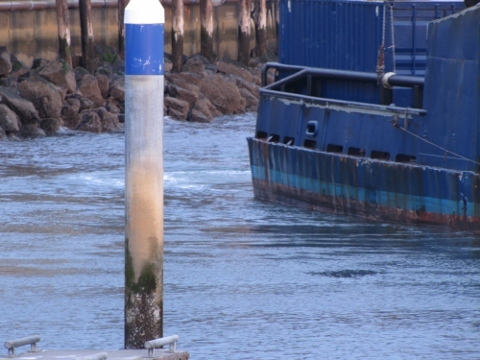 The first time they arrived, he did a U-turn to come onto the commercial dock. Later in the week, they were backed in, and left by backing out. Whenever that boat was underway, we sat on deck and enjoyed the show. 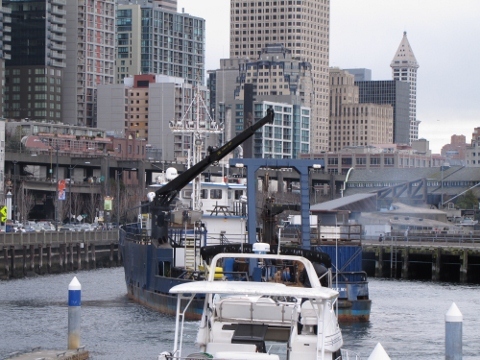 We felt like applauding each time–that was some impressive boat handling. You are right, our 52 is 16′ 1" on beam. I updated the article. Thanks for the correction. No, Aquila doesn’t appear to have thrusters.